The delirium™ family of top-shelf vaping products include everything from innovative e-cigarette kits to liquids, clearomizers, and changeable atomizer heads. delirium™ – a premium brand. 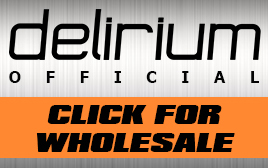 delirium™ has been manufacturing vaping products since 2010 and is recognized as being synonymous with maximum durability, affordable prices, and true vaping pleasure. Thank you for rewarding our efforts. We place the utmost importance on feedback and would love to hear your input. Please contact us for anything you might need and we will get back to you as soon as possible.